Descubra o melhor de Marraquexe com um motorista particular, desde os palácios mouros até os túmulos reais e os caminhos sinuosos do Jardim Majorelle. Viajando no conforto de uma minivan climatizada, você conhecerá alguns dos locais mais pitorescos da cidade, saberá mais sobre a história local e adentrará nas profundezas dos palmeirais, um extenso bosque de palmeiras na periferia da cidade. Escolha entre uma viagem guiada que inclui uma excursão a pé pela cidade antiga e uma excursão apenas com motorista, com partidas disponíveis pela manhã ou à tarde. 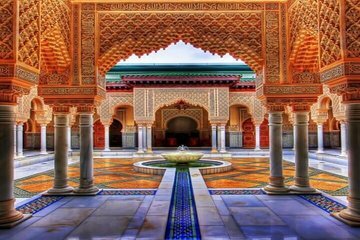 Otman is extremely knowledgeable about the history of Marrakech and Morocco. He is very professional and he has an excellent network of friends and colleagues in Marrakech. He is very respected by all shop owners which makes it a pleasure to walk with him through the Medina. Otman adjusted our tour program to ensure we get the best experience possible of Marrakech. He really walked the extra mile to ensure we were comfortable and well looked after during the tour. He is highly recommended as a tour guide. My husband and I really enjoyed his company and we cannot thank him enough for making the day in Marrakech so special. I would recommend this tour as a starting point for getting to know Marrakech, and definitely recommend our guide Chriif, who was very knowledgeable on the history of Marrakech and the sites visited. 1st time for us 6 girls in Marrakech, so booked this as a taster. Wonderful from start to finish. Driver and guide were wonderful. Booking and confirmation process very easy. We whizzed around the city for whole morning, driver was always ready to pick us up promptly .a varied tour taking in all the main bits including people's bakery, ysl garden , museum,herbalist, carpet shops,median and souls. We were picked up right on time. All attractions were timed and perfect in the amount allowed. Water was provided. Our driver was wonderful, gave history and even made us an appointment at a local hammam which was amazing. This tour was a highlight of our entire holiday! An excellent tour but very short. If you have a short time available it is very suitable and touches on the highlights. The driver and guide were very good and very accommodating. We recommend this tour if you have a short time available. We had such a lovely day with Yaya - he took us to the places we wanted to go to and went out of his way to help us find this particular shop in the Medina! Thank you so much, we did so much and had a lovely day!!! Definitely worth doing if you're in Marrakech for a short trip! Thank you to Taha too for being a lovely driver! We were taken by the tour guide to carpet shop yesterday 26/9, it took quite a lot of time of having the carpet shop showing us about 15 pieces of carpets. Later, we were driven to a herb shop, we got to pay 4760 kr for some dried leaves/herbs, few skin care, 1 bottle argan oil. I ask them to list down the items with prices but they refused to do so. Remember to ask for the prices for every item you wish to buy. In Sweden, all prices and the weight of the goods are clearly stated, and I don't feel good at all for this trip! Mustafa, our guide, took us for a perfect guided tour through Marrakech. The combination of being driven to drop off points and then walking to certain destinations, was a perfect mix for us. The Jardin Marjorelle, the palace of the old kings wifes, the cooperatives for oils/spices and carpet productions, were all very interesting, to the level that we ended up buying both Argan oil and a beautiful, large hand made carpet, at bargain for us.. prices. I can highly recommend this tour. P.S. as for any tours in this part of the world I'd recommend to bring water and wear a hat/cap during the day. Driver was great! Took us quickly to all the sights. Car was clean and trip was super safe! Very happy to see the city this way.